Mexican Stuffed Sweet Potatoes! 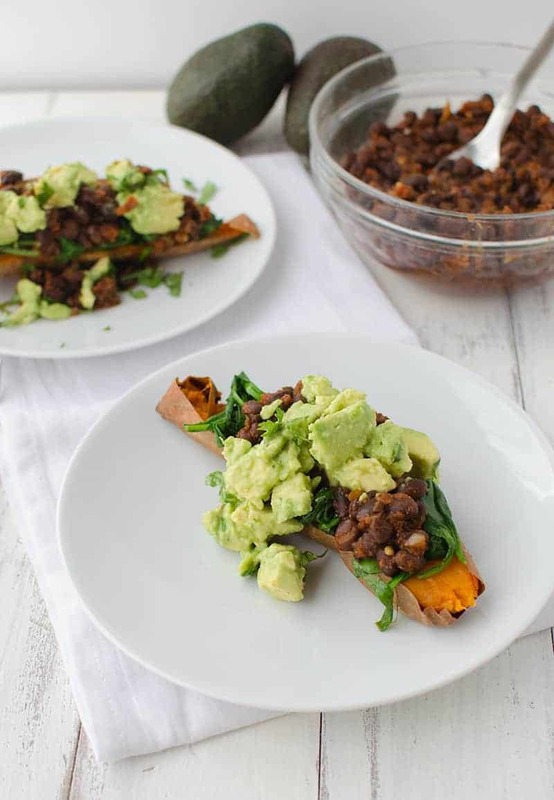 Baked potatoes stuffed with spinach, spicy black beans, avocado and cilantro. This meal is so filling and packed with nutrition! Gluten free and vegan! Gimme all the sweet potatoes! Oh my goodness, I cannot stop eating this one! It’s like my own personal Chipotle burrito bowl- swapping in a juicy sweet potato for the rice. 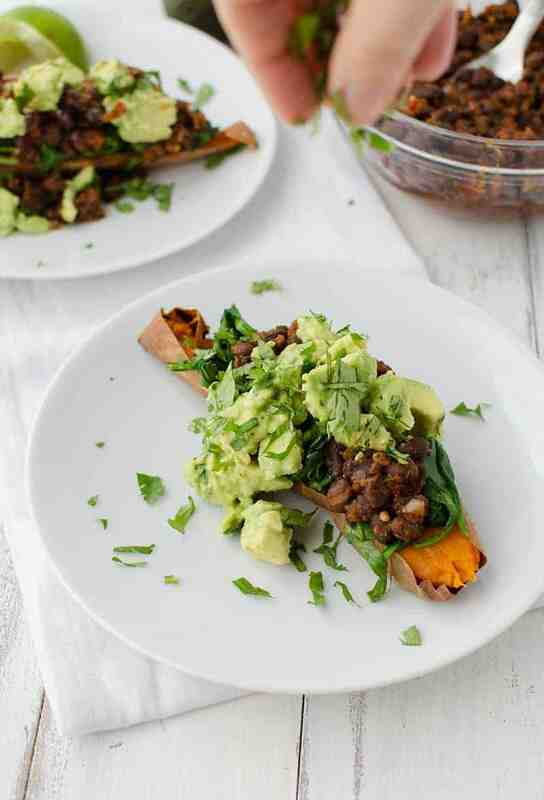 Topped with spicy beans, sauteed spinach and loads of fresh avocado. I made this for lunch last Sunday and for dinner Monday night and again last night. Just try to get the taste of these stuffed sweet potatoes outta your head. A few weeks ago, when I attended the Food and Nutrition Conference in Atlanta, I had the pleasure of dining with some of my favorite RDs and the lovely people from the Hass Avocado Board. Yes, an entire 3-course meal centered around avocados is as amazing as it sounds! Besides the ‘is this real life?” feeling after each new course, I was able to spend time talking with farmers and researchers about the latest science behind avocados. If you’ve been following this blog for even a week, you know how much I love avocados and am always finding new ways to eat them- on toast, in soup, stuffed into wontons, and now on these potatoes. Hearing about how good avocados actually are for you is the best justification I can think of for piling them on meal after meal. And while I’ve consistently praised the beneficial fiber and fat content of avocados before, it seems that there is more to the story. Combining avocados with beta-carotene food sources (like tomatoes, carrots or sweet potatoes!) increases absorption of the beta-carotene. Which is why I’m eating these Mexican stuffed sweet potatoes morning, noon and night. For nutrition of course. The best part about these stuffed potatoes is the fact that they are customizable for the entire family. Dislike cilantro? Don’t add it! Prefer salsa over spinach? Do it! I imagine setting out various bowls of toppings and letting everyone garnish as preferred. Pierce the potatoes with a fork 1-2 times. Place the sweet potatoes in the oven and bake for 45-50 minutes until cooked through. While the potatoes are cooking, combine the black beans, salsa and spices together in a sauce pan. Cook over medium heat for 15 minutes, stirring occasionally. Once the black beans are done, remove them from the pan and keep warm in a bowl. Using the same pan, heat 1 tsp. oil over medium heat and add the spinach and garlic. Lightly stir until just wilted. Remove the sweet potatoes from the oven and halve. 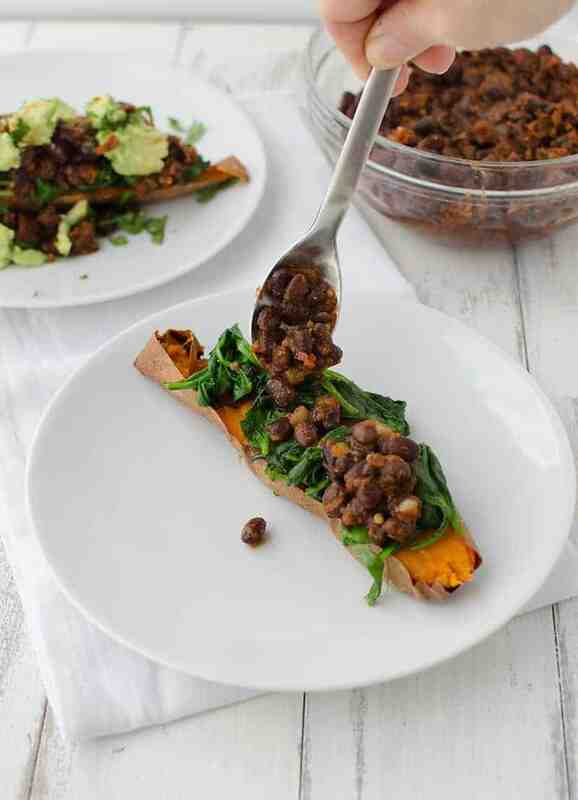 To serve, spoon the spinach onto the potatoes followed by the black beans. Top with diced avocado and cilantro. I was the same way! but then i remembered how much I love sweet potato and black bean burritos and this is my take! These look amazing! You can’t go wrong with anything that you can put guacamole on. My thoughts exactly 🙂 Actually, that’s pretty much my life motto. All of my favorite flavors are included here – yum! I can only imagine how awesome a whole dinner centered around avocados would be. Love the tip about eating them with beta carotene. I’ve been doing the lazy version of this restaurant pretty regularly – usually some store-bought chili and Phoney Balony bacon on top. So good! Oh that sounds awesome! I’ve been meaning to try Phoney Balony! ooh I love Mexican spices and black beans. One of these days we will have to meet up for cooking and lunch! Mmm, my mother would love these. This would be a great dish to make for my parents sometime. And a cheap recipe too! I like it.